This week’s post about red wine bias among wine critics did everything that we hoped it would do: Get people talking about what our study means. There has been some tremendous discussion – not just here, but elsewhere around the cyber-ether. My biggest surprise? That so many mainstream wine critics picked up on the study and offered serious comment, instead of dismissing it out of hand. That’s my mistake, in assuming the worst. My biggest disappointment? That not enough people saw the study as one more example of everything that’s wrong with wine scores. That was a common theme among the comments, emails, and discussions Suneal and I found – that only wines made with serious grapes deserve the best scores, and the only serious white grape is chardonnay (and don’t even think about mentioning rose). So, according to this argument, why should anyone be surprised by any kind of bias? It’s only natural and right. Which, of course, made me very sad – the some animals are more equal than other animals theory. 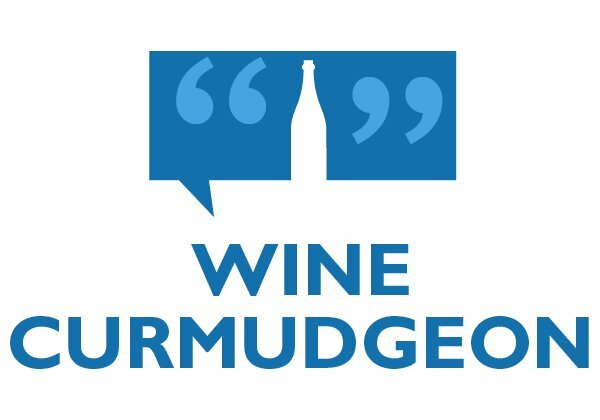 • A mostly favorable discussion on the Wine Berserkers site, which also surprised me. It’s the Internet – who says nice things? • Winemakers, not surprisingly, were split. Those who focus on white wine (and several left comments on the blog) disagreed that red was more difficult or more expensive to make. 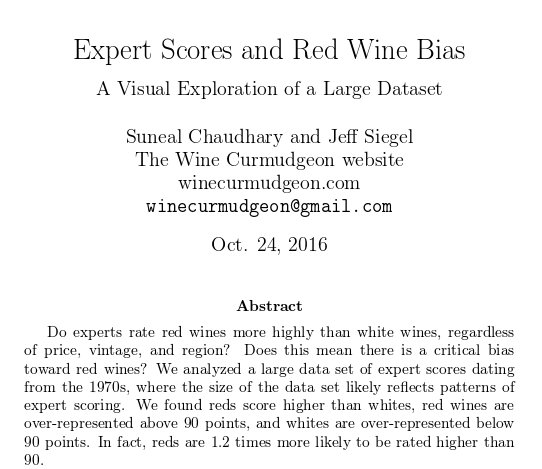 Red winemakers, not surprisingly, said of that course red was more expensive and more difficult, so why shouldn’t it get higher scores? • Another blog reader, Bob Henry, found several old magazine articles and blog posts discussing this subject, including an interview with Robert Parker in what was then called Wine Times and today is the Wine Enthusiast. In the interview, which is at the link, Parker said that some red wines are indeed more serious than others, and that his scoring system reflects that. I wonder if Parker would disavow that comment today – or if the Wine Advocate still uses that approach.
? More wine in Dallas, please: The Wine Curmudgeon has noted many times that Dallas residents treat wine as if they were afraid of it, and now we have statistical evidence to support my observation. A Harris Poll found that Dallas residents are the least likely of anyone in the country’s 10 biggest metro areas to drink wine, and that we lead the country in not drinking any alcohol at all. No wonder we spend way too much time obsessing over the Cowboys. Obviously, I have my work cut out for me, and will continue to urge responsible cheap wine drinking on the masses. It’s the least I can do.
? 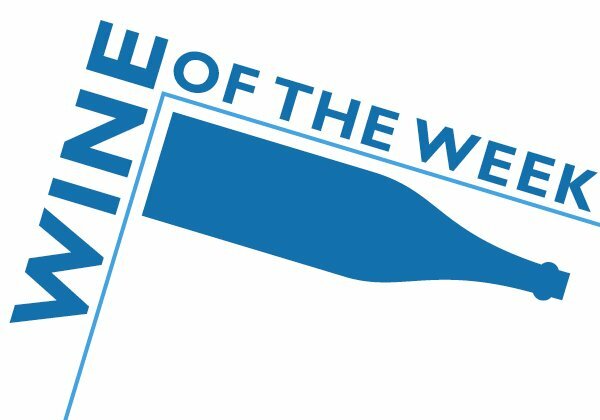 Some wines are more equal than others: Kyle Schlachter at Colorado Wine Press, who has much more patience with the Winestream Media than I have, reports on what appears to be the Wine Spectator’s double standard for choosing wines to review. The magazine has said it won’t review some wines (in this case, from Colorado) if they they aren’t widely available. On the other hand, it recently reviewed several wines from France that weren’t widely available (10 cases or less in the U.S.). Schlachter seemed surprised by this contradiction, but that’s only because he hasn’t been dealing with this kind of hypocrisy for as long as I have. 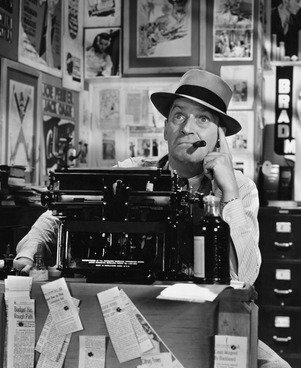 The Spectator does what the Spectator does; that’s why it is the Spectator. And why it has a Curmudgie named after it.
? 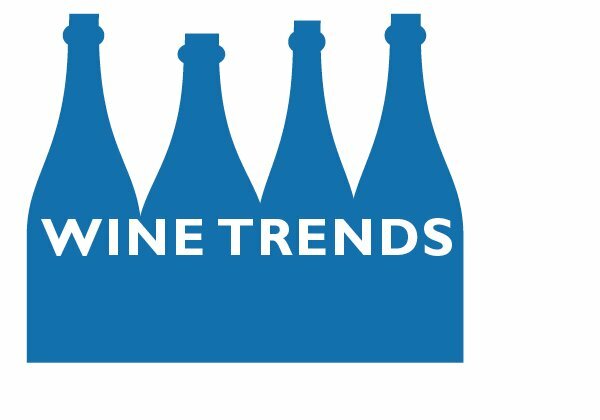 Democratizing wine: David White of the Terroirist has a fine take on the changes in the wine business, led by consumers who make up their own minds about what they want to drink. 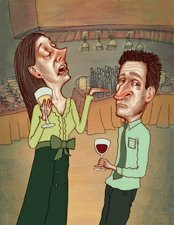 He quotes Jancis Robinson, the preeminent European critic: ” ?No longer are wine critics and reasonably well-known wine writers like me sitting on a pedestal, haughtily handing down our judgments. Nowadays ? [consumers] can make up their own minds. That ?s altogether a lot healthier. ? It’s also intriguing, from my perspective, that some of the best and most well-known critics in the world see this change and approve of it. That means they have the well being of wine and wine drinkers at heart, and not whether they continue to be important and famous. 1. “I can’t believe you’re drinking sweet wine.” Some of the best wine in the world is sweet — rieslings, whether from Germany, New York or elsewhere, and dessert wines, including the $550 French Chateau d’Yquem. Yes, pink moscato or red raspberry is not highly rated by the Winestream Media, but who are they to judge? After all, don’t they believe in the magical gateway wine? 2. “I used to buy that, and then I learned more about wine.” This actually happened to me. A guy I knew saw I was buying an ordinary French red, and said I should buy his French red. Which I did, and it was a waste of money — more expensive and not any better. I learned an important lesson that day about wine and peer pressure. Which is to ignore it. 3. “I just bought a bunch of 92-point wines, and they were only $30 each — such a deal.” Any wine that costs more than $15, given the foolishness of points, should score 92 points. At least. In fact, given the rampant score inflation that has apparently going on over the past couple of years, anyone who spends $30 a bottle for a 92-point wine shouldn’t be bragging about it. They should be consulting the $10 Hall of Fame. 4. “Texas wine? Haven’t they given up on that yet?” You can substitute your local wine region here, but the sentiment is the same. Despite all of the progress we have made, too many wine drinkers, wine critics, and wine snobs still insist they know best about regional wine because they didn’t enjoy the glass they had when Jimmy Carter was president. 5. “The last time I was in Napa, I had the most amazing wine. … ” Wine travel snobbery is among the worst, implying that the only amazing wines can be found by people rich or lucky enough to go where the wine is made. This is obviously not true; the Wine Curmudgeon has found some amazing wines digging around the closeout bin at his local Italian wine specialist. Which is 10 minutes from my house with free parking.
? FTC will investigate alcohol ads: The rise of social media has had an unintended consequence — exposing underage consumers to wine, beer and spirits ads that they might not have seen before. After all, how many 12-year-olds read the Wine Spectator? Hence the news that the Federal Trade Commission is requiring the major alcoholic beverage advertisers to detail their use of digital marketing and data collection practices. Adweek reports that in 2008, these companies spent just 2 percent of their marketing buget on new media, but that regulators expect that that figure has increased significantly over the past several years. In fact, says the story, the biggest booze producers have found social media to be quite effective at reaching younger consumers, and telling the difference between young and too young in the cyber-ether is quite difficult.
? Did top critic take cash? That's what a Montreal newspaper, La Presse, is reporting. The French-language newspaper says former Wine Spectator critic James Suckling was paid C$24,000 (about US$24,200) by the Quebec liquor authority, which runs the province's wine stores, and the hint is that it was for favorable reviews. This is the latest in a series of pay for play scandals among the Winestream Media that included Robert Parker's Wine Advocate. 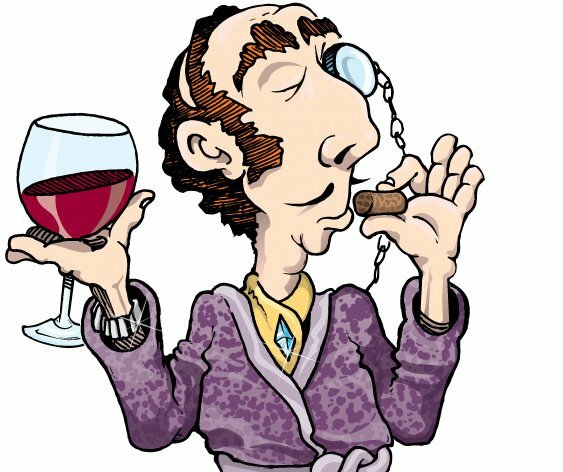 The Wine Curmudgeon is shocked, shocked, to learn that gambling is going on.
? 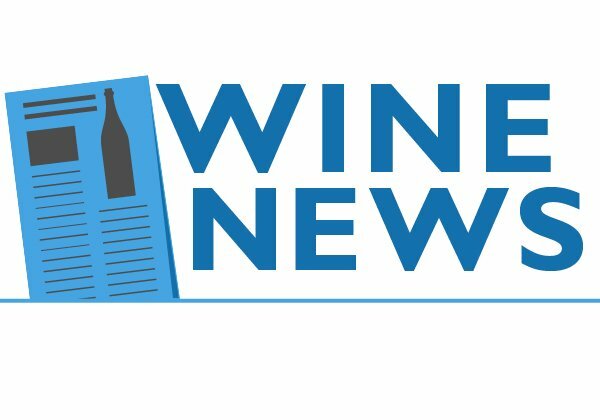 Decanter readers don't want cheap wine: Decanter, the English wine magazine, has been accused of "unashamed elitism" in a letter from a reader. So it ran a poll asking if it should review cheaper wines. The answer? Not really. 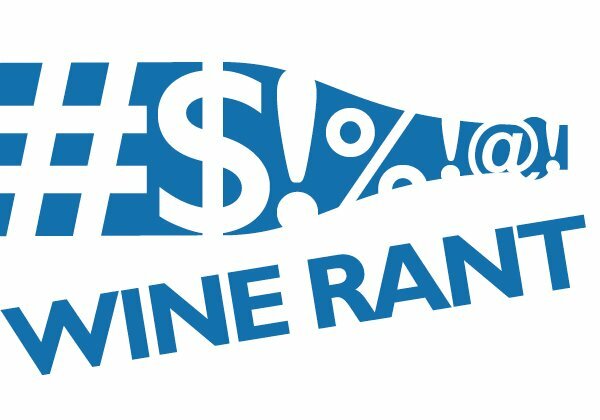 Only 27 percent of respondents said the magazine should review more wines costing less than 10 (about US$16), while the rest said either the current policy was OK or that maybe wines for less than 15 (about $US24) would be acceptable. This is yet another example of why there will always be an England.